My boys wanted a pirate birthday party. 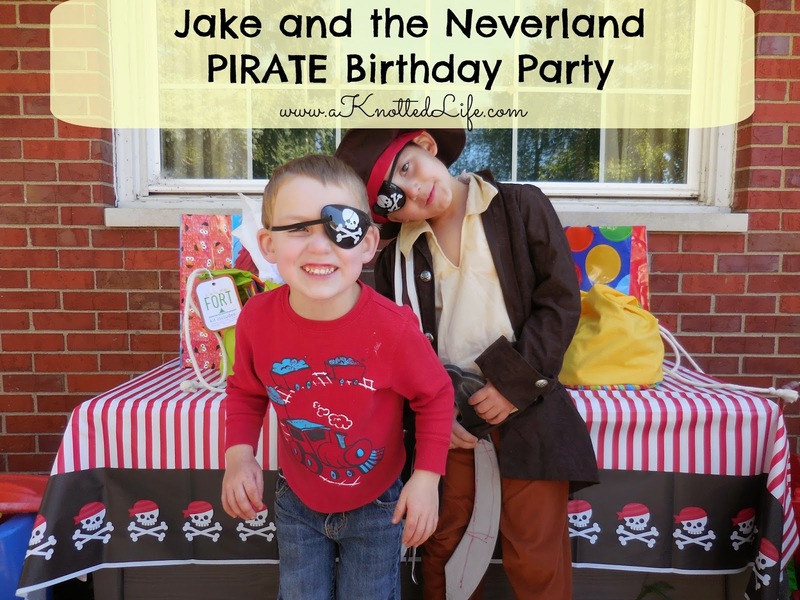 JF wanted it to be a Jake and the Neverland Pirates party and Ben wanted it to be just pirates. I blended the two and everyone was happy. 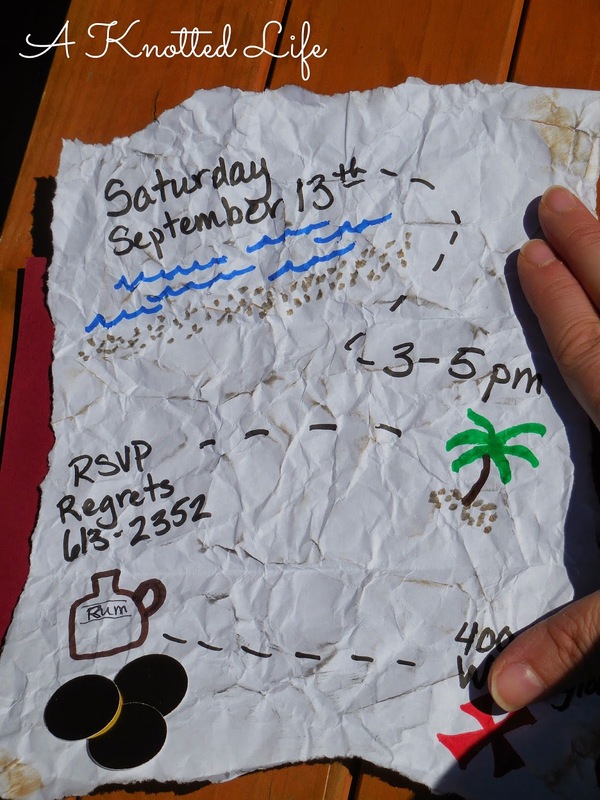 The first thing we did was make some pirate-y invitations. I always like to include pictures of my kids on their birthday party invitations, that allows grandparents, great grandparents, godparents, and other loved ones to always have a current picture of my children. Red cardstock + scrapbook paper. Then we had the kids crumple sheets of white paper and I wrote in my best Pirate. I also "dirtied" the paper up a bit with some brown and black ink. The back of the card had a treasure map, which we folded into thirds and taped on the back. Again, the kids crumpled the paper. I drew the map with markers and used ink to age it. We also punched out "gold doubloons" using a handy circle punch and some shiny, golden paper. I laid the food out on our two-tiered kitchen peninsula. I covered the counter with a cheap, plastic tablecloth and a belly dancing wrap with fake gold coins that we got at a Lebanese wedding reception. I used a skull from our Halloween decoration bin and my childhood Peter Pan snow globe that now sits on L's dresser. Golden plates, one package of special pirate napkins from Target, and then some red and white striped napkins from Wal Mart's party section and we were set. Ben always talks about "Captain Orangebeard" and so his Mormor found a captain with an orange beard. We had Captain Hook and Smee's Fish and Chips. Because of allergies I kept the two separate, though most people mix them. Two little tips: #1 I put an upside down bowl in the bottom of the big blue bowl so it looked more full. I knew I wanted to use the pretty blue bowl so it'd be remenisenct of the sea but it would take *a lot* of bags of Goldfish and I wasn't going to spend that much money. But the upside down bowl worked perfectly! #2 The chips are actually in a trick or treat bucket from when one of my boys was a pirate. I knew there was something pirate-y about a dead man's chest so I thought I'd use white chocolate covered pretzels - which kind of look like rib bones, right? - as a dead man's chest. And then the night before the party I googled it and learned that the chest is referring to a treasure chest. Auntie Leila said to do it anyways and she's a BOSS at homemaking so I took her go ahead as more than good enough. Some pirate parties had a plate of crackers labeled "Polly's Crackers" which I really loved. I called them Scully's, keeping with the Jake characters. My mother- and sister-in-law also made the cake. Isn't it awesome? 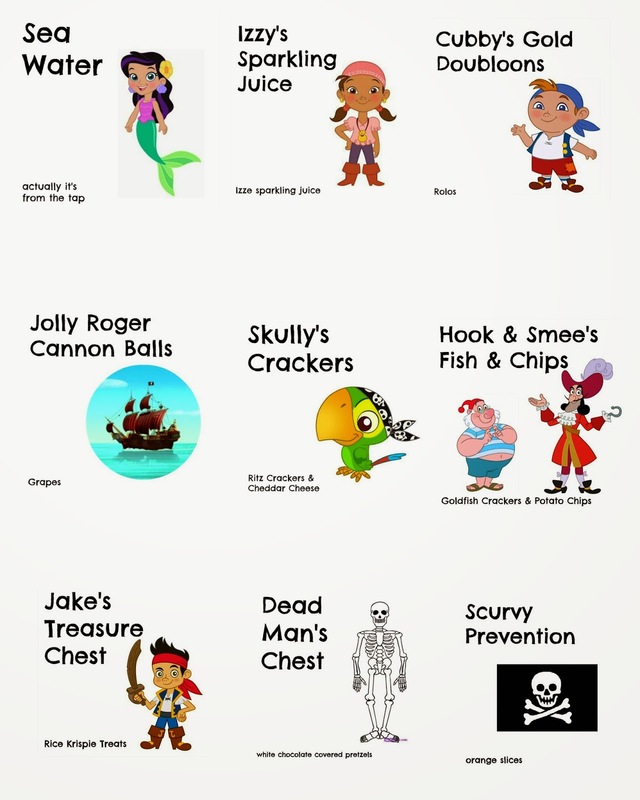 The Hook, Jolly Rodger, and Jake are all regular toys. The beach is made from brown sugar. The treasure chest was made of Kit Kat bars and was filled with yellow Skittles. Because of JF's allergies he wasn't able to eat the cake but I had special Rice Krispie Treats ready for him. They were supposed to be shaped like treasure chests but someone dropped the ball on that one. If you know kids with wheat, soy, egg, dairy, and nut allergies a great alternative for a sweet treat for them are Rice Krispie Treats made with coconut oil instead of butter. Make sure you read labels but I've found Kroger's Crisp Rice cereal and marshmallows to be safe. You won't miss the butter - I promise! I wanted to keep things pretty simple with the drinks. I had Sea Water, also known as ice water and some Izze carbonated juice. 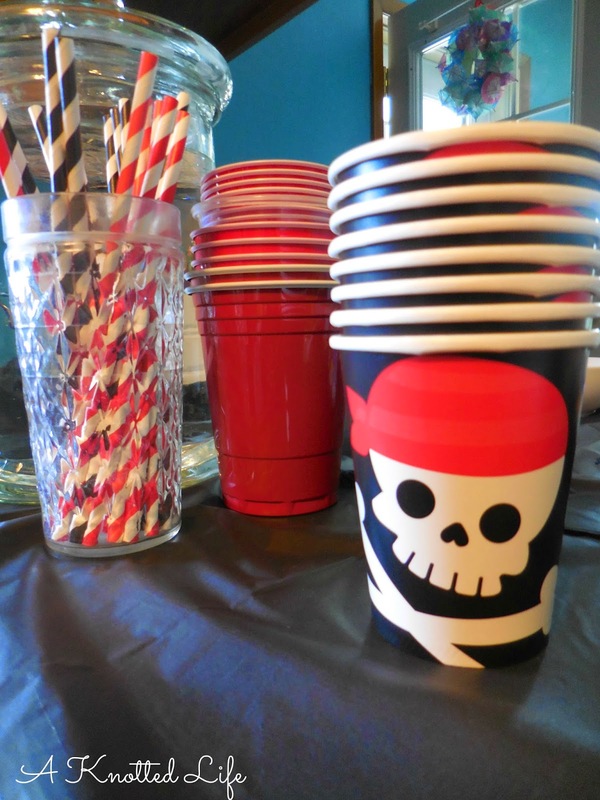 Paper straws and pirate cups from Target. The Izze juices I renamed Izzy's Carbonated Juice and my boys were delighted. It was a really simple way to tie in a Jake and the Neverland Pirates character. These are the little signs I made to label the food. Ben dressed in his pirate costume for the whole party. I also had eye patches, purchased in the party section at Wal Mart, on the tables. People - okay me and the kids - wore them throughout the party. Some of the gifts even got in the spirit! a pirate ship shirt for the baby brother. Our fishy bubble blower was a nice touch and the kids loved it! I didn't want to do games but I did want to have some activities the kids could do whenever they wanted. 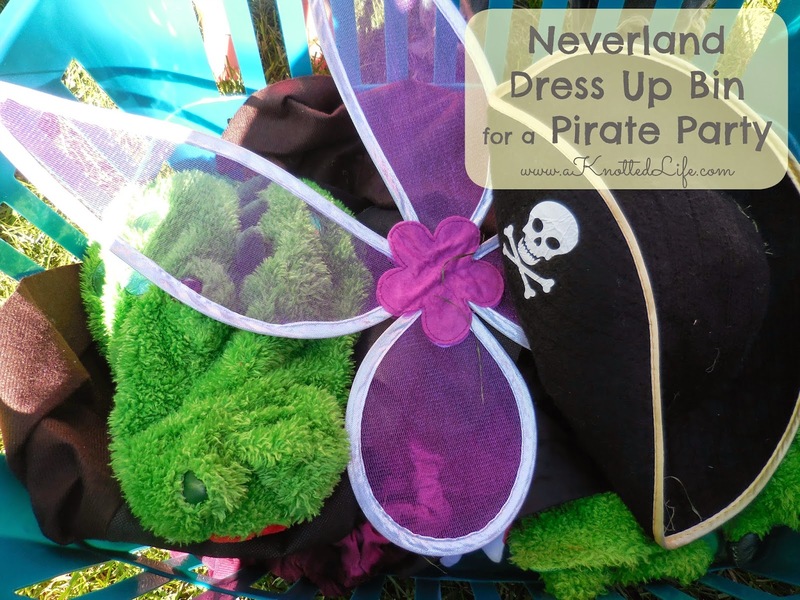 The first and easiest was gathering all our fairy and pirate dress up clothes, throwing in the dinosaur costume, and calling it the Neverland Dress Up Bin. All the kids loved it! Here's the Tic Toc Croc! I also buried some treasure in a small sandbox. The kid could dig for bubbles, fake jewels from the craft section, and a few little odds and ends. Finally, we had a plank. Travis actually made a diving board type plank with some lumber we had in the garage and basement. 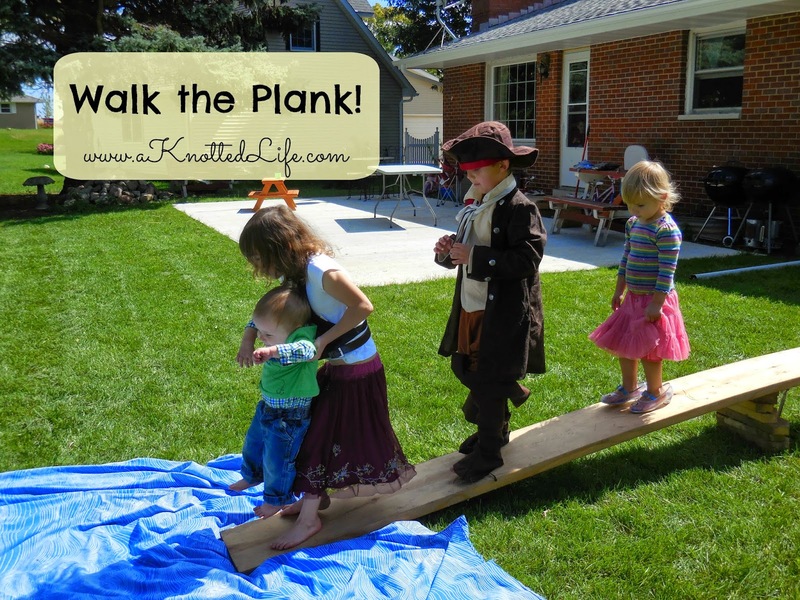 The kids walked the plank over and over and over again. Because it was a cool day we didn't want to use a baby pool with water underneath. Instead I borrowed a sheet from my mom. It's blue and has these neat white swirls on it, and they always reminded me of the ocean. The whole afternoon was a lot of fun. Ben and JF loved every little bit of it and it was relatively easy to do! Of course, Pinterest helped me out a great deal with lots of fun ideas. 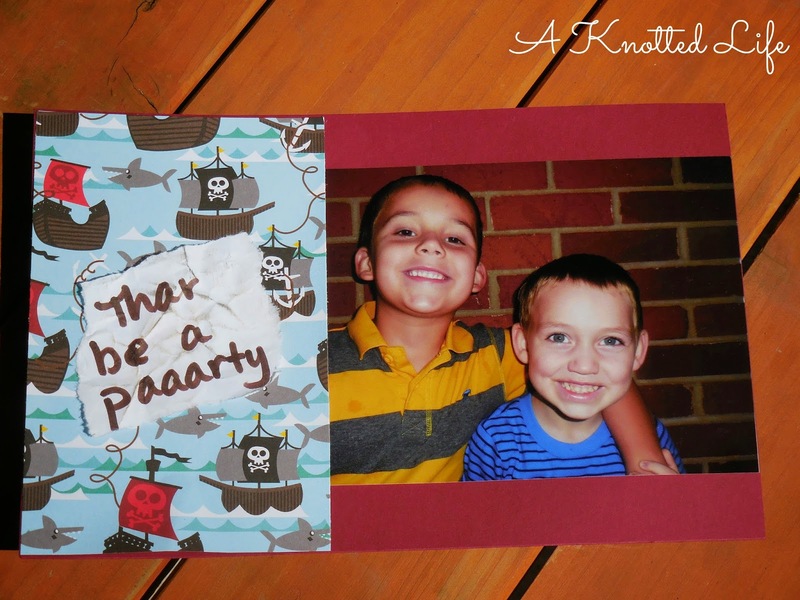 You can see my pirate birthday pARRRRRty board here. What fun! Looks like a great party!!! Love the independent game idea! I hate running games! I do too. It was SO easy to just tell the kids as they arrived and let them do what they wanted to do when they wanted to do it. The kids got to wander about and come back to things again and again. I enjoyed the party more because of it! So you can actually buy a fun jump for the price of renting one. I don't do games, or parties very well, truth be told (comment below). BUT the mini-fun-jump has saved my rear on the parties we have had. It counted as our kiddos presents for the year and we get to use it whenever we want! Already has paid for itself. Anyway! Hoping this is a good suggestion! That's a great tip, Suzette! Thanks for sharing that idea. I'll have to look into that one. lol In my neck of the woods it might be. I've heard before that the only place in the world where there are more Lebanese people than Peoria, Illinois is Lebanon. I love your parties, I wanna move to your neighborhood so I can invite myself to an Engstrom party haha. But seriously, you are one creative mama! Fun!! I love the watermelon ship! That's awesome!! Your homemaking skills are lightyears ahead of me! You are AMAZING. This is like, a legit party. My kids don't even always get parties…I know. Maybe if I don't have a newborn in 2015 then I can aim to actually throw a few parties. You should probably pray that party grace falls on me. lol Great job sista! I enjoy it, and I will say that Pinterest has only made things worse. But I have been pretty lucky in my party planning. We have really awesome cakes because we know people who can make really awesome cakes and will do it for free. I don't have the money to buy stuff off Etsy or even to get name brand party stuff. I find images online and then use PicMonkey to make the themes my kids' choose work. Some people have money to pay for that stuff but not us, so I've had to get creative. I also learned an important lesson when I got married. I got married in the season of Christmas. The Church was *gorgeous* and all we had to do was plug in the lights on the tree. All of downtown was decorated for Christmas - and so everything glittered for my wedding, too. I've tried to do the same with some of the parties, too. Like Halloween and pirate stuff have a lot of overlap, as did the Red, White and Blue party right after the 4th of July. It makes things cheaper and easier to find. I LOVE your party themes! I never get that creative, which is sad because I love creative. :) Looks like everyone had a great time! Izzy Soda is the best! I cant have dairy, Gluten, nuts/tree nuts... the list goes on. My godson cannot have eggs, peanuts and dairy. When we have bashes I make us a cake or cupcakes and they have alway been a hit, although the first few were a learning experience. I have even gone on to use fondant (like in cake boss) that is also allergy friendy. If you ever want some baking tips let me know. I also know an amazing top 8 allergy free cook/baker personally that has three books out and just started to have her own line of cookies. Her stuff is really great, and she started because her sons have serious allergies. I also am not sure how far away you life from me (we went to the same Newman center) but I can away offer up my baking skills. Almost all my allergies are life threatening, so I understand the importance of being super super safe, and how scary not being able to breath and how scary using an epipen is. 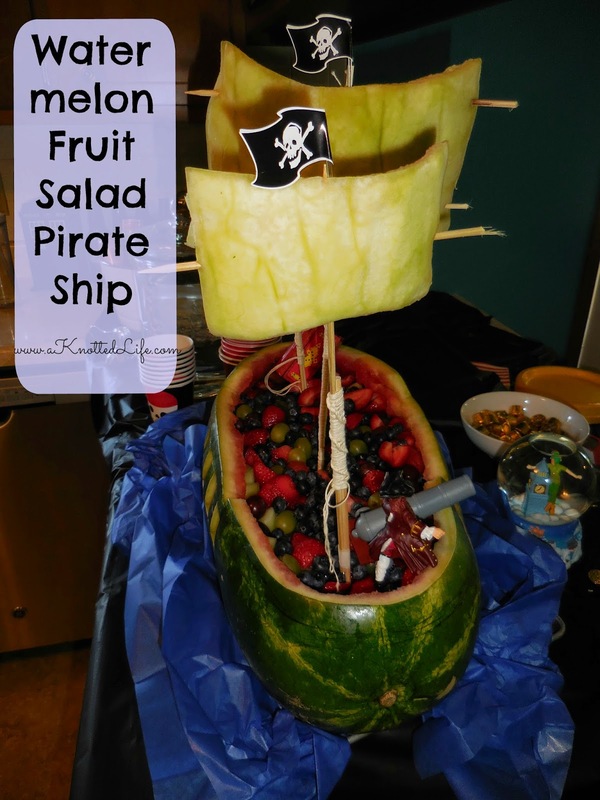 Love the pirate ship watermelon and the Walk the Plank! Well done!! !